Step out to the backyard garden. Pick a few turnips and bring bring them to school. Take out the paints, brushes, paper and containers of water. Look at all the different greens and purples on the plants. See how the leaves curve in and out. Which part of the turnip grows underground? Why is the root purple? Could your paintings also show the soil, the surrounding plants, and the animals that visit the garden? For more ideas for school projects in the garden, check GreenSTEM Learning by Mary Van Dyke. And if you’ll be in Arlington, Virginia, in October attend the 2017 Virginia Agriculture Summit. My daughter planted seeds and placed the pots in our kitchen window. They’ve sprouted! We forgot to label the containers, but we’ll recognize some of the vegetables by the shapes of their leaves. As for the others … oops! Expect a few surprises. In April and May, I’ll join first graders to create art inspired by nature. One of the first things we’ll do is sketch the plants sprouting up at school. The students love to remind me to “visualize.” It’s fun to close our eyes and think of a picture and then paint it! Here’s my painting of the salad I’ll eat — made up of vegetables grown in the next few months. How do you imagine you’ll enjoy the outdoors this spring? I’m excited to hear from Mary Van Dyke at Green STEM Learning about a group that shares ideas for school gardens and outdoor learning — the Virginia Association for Environmental Educators. For information on caring for a backyard garden, I check the web site of The Master Gardeners of Northern Virginia. And when I feel like sitting down with a book, I read about vegetables, herbs and their botanical families in Vegetable Literacy by Deborah Madison. Looking forward to spring harvests! 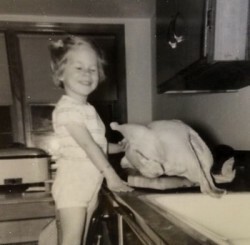 In my family we learned to accept responsibility early in life. I was the sous chef, and I fixed the turkey. Okay, I might be padding my resume. I assisted the chef. I was an enthusiastic carnivore as a child, but now I really love vegetables. My daughter tends our backyard garden, and this week she’s built a hoop structure with pipes and sheets of plastic. It will protect the parsley, thyme, kale and other greens through the winter. I’m thankful to have children who like to grow things that I like to eat! 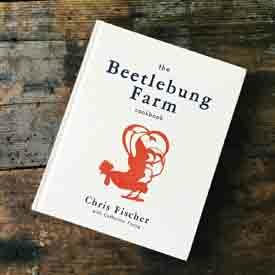 As we plan holiday menus, I’m reading The Beetlebung Farm Cookbook, written by chef and farmer, Chris Fischer, in collaboration with chef and writer, Catherine Young. You might have seen the recipes and review in The New York Times food blog. The book tells the story of a family farm on Martha’s Vineyard, complete with descriptions of mouthwatering meals and recipes for ingredients straight from the seashore, pasture and garden. Last year I wrote about recipes and books to share with children over the holidays. You’ll find several books by Virginia authors in that discussion. Many writers released new titles this year. I hope to write more about them in a future post. After months of neglect and three feet of February snow, my garden’s a maze of sticks, weeds and whatever else fell from the sky. A few shoots of parsley and a bed of lemon thyme are springing back to life. Time to break out the rakes, trowel and garden gloves. I usually plant tomatoes, peppers and squash, but maybe I should try a few new vegetables this year. 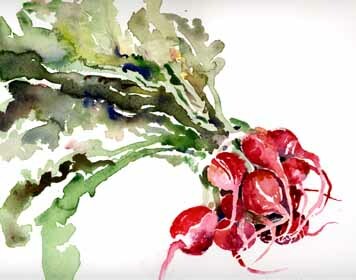 Radishes? What else would be tasty? Any ideas? I’ve found useful advice from Tony Maniezzo, food garden horticulturalist at the Botanical Garden of the University of British Columbia.